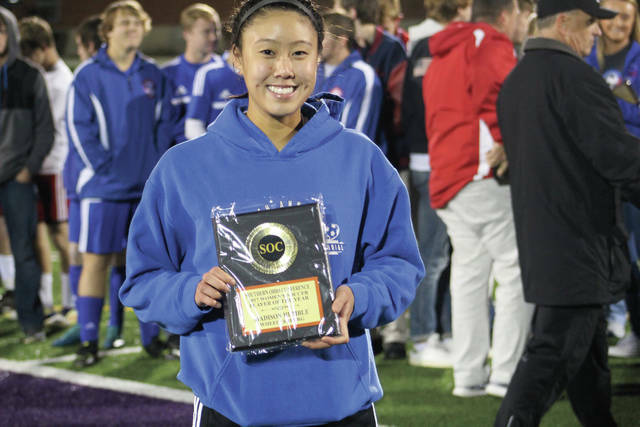 Humble shows off her SOC Player of the Year award. Humble prepares for a free kick in a match against Greenup County earlier this season. 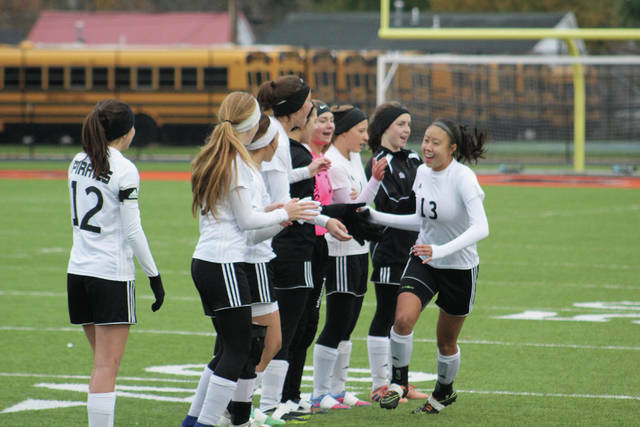 Madison Humble is serenaded by her teammates during pregame introductions of the district championship game at Waverly. To be successful at something in life, a lot of hard work is involved. While that dedication goes a long way, it isn’t the only element needed. Being passionate about the things you choose to pursue in life can make success a lot easier to come by. 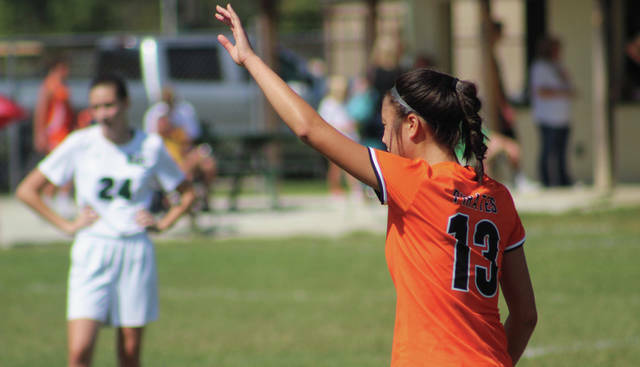 For Wheelersburg senior Madison Humble, soccer is everything. She has centered her life on her favorite game, and in the process met new friends and made many memories. Humble has combined a relentless work ethic with a deep affection for the sport. Her desire to better herself and those around her was on full display throughout what was a season to remember this year, and a career that will go down as one of the best in all of Scioto County soccer regardless of gender. Humble had a breakout season this year for the Pirates in her first year with the school, totaling 34 goals and 23 assists. Those numbers finished tied for 12th most and 7th most in the entire state of Ohio among girls regardless of division according to stats on the OSSCA website. But to get to that point, it took countless hours of time and lots of hard work. It took years of playing for club soccer teams like the First Capital Futbol Club in Chillicothe and the Freedom Soccer Club near Columbus. It even took two years at Valley, where Humble played with the boy’s team. She remains tireless when it comes to the sport, saying she doesn’t ever take a break from soccer. Humble didn’t always love soccer, at least not at first. She remembers her first coach being a familiar face. “It’s actually really funny,” Humble said. “I think I was in first grade, and Kevin Powell was actually my first coach in rec league. I didn’t really fall in love with it then, but a few years later I started playing fustal at the YMCA. Powell is currently an assistant coach on the Wheelersburg staff, reunited this season with Humble. Leading up to this year, Humble had a lot of experience from both club soccer and playing at Valley. She was an All-SOC first team selection with the Indians in 2016. Both teams were able to offer different challenges, and helped shape Humble into the player she is today. At Valley, Humble played on a team that featured both boys and girls in the SOC I division, and was flattered to make the first team last year. Humble not only played soccer during the fall season in years past, but was constantly playing as a member of a travel club team. Despite the seemingly never ending pace, she still embraced the grind. It was amazing, but also trying. That discipline developed playing soccer year round and trying to balance other areas of life in high school. Still, Humble would recommend playing club soccer to anyone around who loves the game. Playing year round helped Humble to hone in on her skills and improve as a player. It also challenged her as an individual, but in the end it paid off with great results as evident in her performance as a Pirate this year. When Humble moved to Wheelersburg, she didn’t have much of a learning curve to adjust to and was able to fit in right away. The Pirates meshed well on their way to finishing with a 18-1-1 record and winning the district title. That district title win is something Humble will always cherish with her teammates. Humble had more than a few friends on the team. Those friendships won’t be forgotten for Humble, who says she will miss her friends more than anything on the field. Although it was only her first year, Humble fit in to the family at Wheelersburg as well. Quickly, she realized how proud her fellow Pirates were of their school. “They have a lot of pride, and they deserve it,” Humble said. “You can see it in the school, all the trophies they’ve earned. Something I’ve noticed since I’ve come here is every sport, everyone works hard. According to Humble, the Lady Pirates aren’t going away any time soon, either. The future looks bright for Humble as well, as she has plans to play at the next level and attend college. This season, the Saints of Limestone University finished 17-3-1 in NCAA Division II play. Limestone is located in Gaffney, South Carolina. Humble hasn’t set any goals just yet, but hopes she can compete with her team right away. “It’s really hard to start going in your freshman year, but I’m hoping to get minutes and I’m willing to do anything it takes,” Humble said. There are several expectations that Humble has, however. That phrase might be commonplace, but for Humble it’s everyday life. With a passion for a sport she loves and a chance to pursue a great career, Humble seems destined for a bright future given her past accomplishments. As the old saying goes, from humble beginnings come great things.